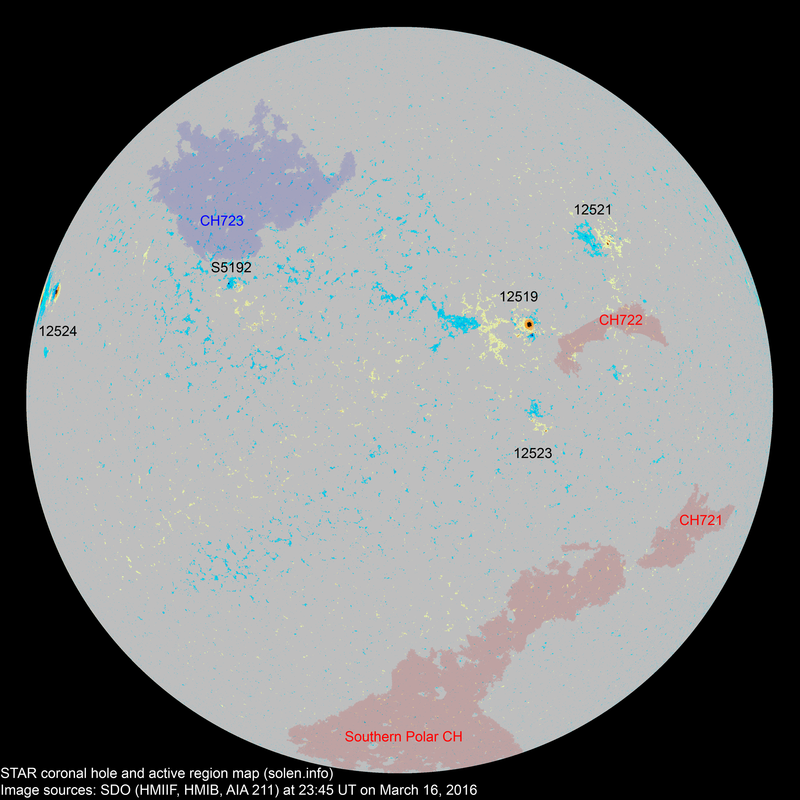 Last major update issued on March 17, 2016 at 04:10 UT. The geomagnetic field was quiet to minor storm on March 16 under the influence of a high speed stream from CH721 during the first half of the day. 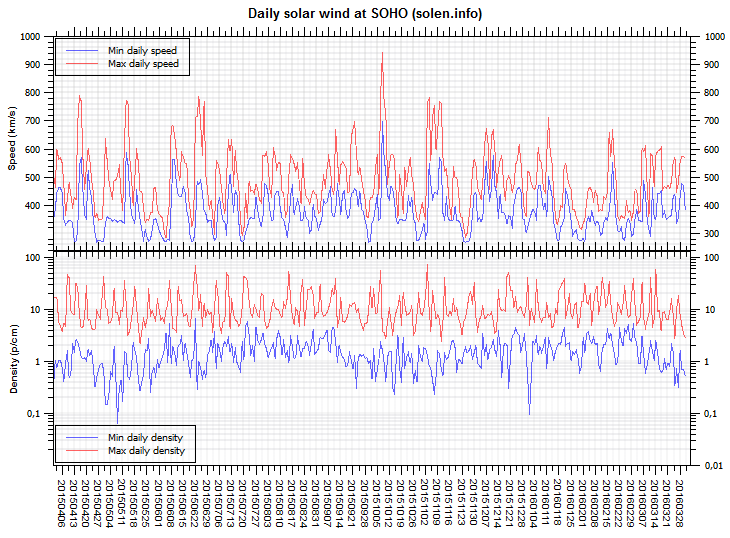 Solar wind speed at SOHO ranged between 442 and 595 km/s. A high speed stream associated with CH722 arrived near noon and caused a gradual increase in solar wind speed for the remainder of the day as well as a minor increase in the total field of the IMF and a stronger southward Bz component. 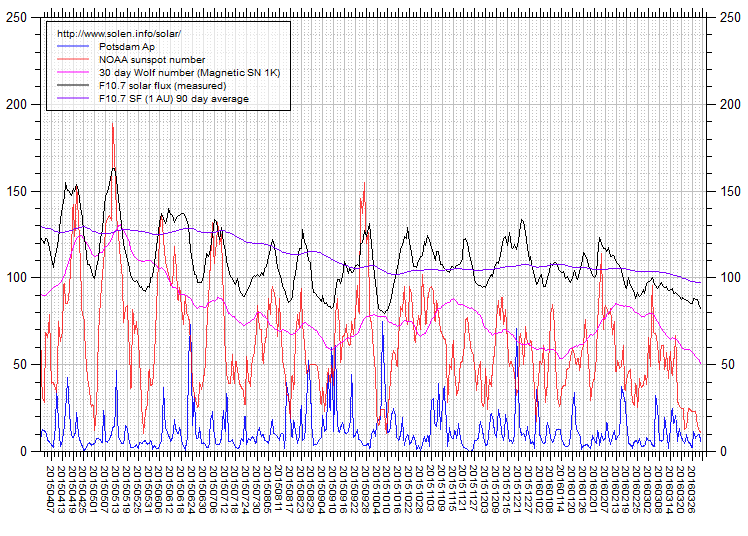 Solar flux at 20h UTC on 2.8 GHz was 91.0 (decreasing 3.9 over the last solar rotation). 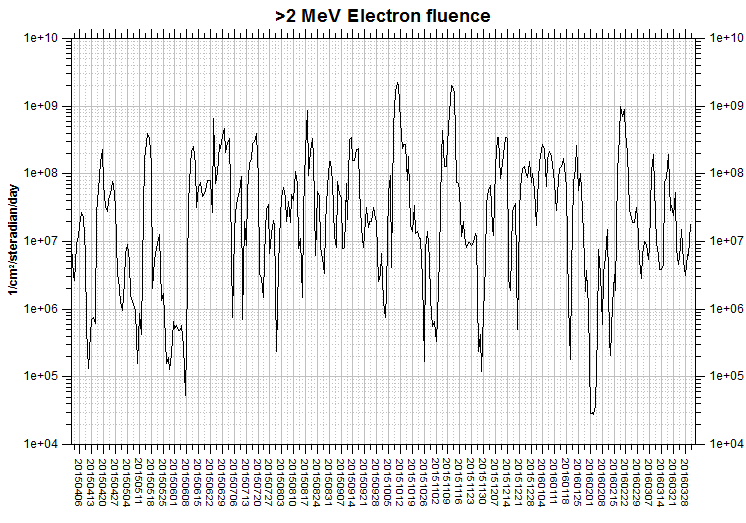 The 90 day 10.7 flux at 1 AU was 101.4. The Potsdam WDC planetary A index was 16 (STAR Ap - based on the mean of three hour interval ap indices: 16.3). Three hour interval K indices: 52232134 (planetary), 43333233 (Boulder). At the time of counting spots (see image time), spots were observed in 5 active regions using 2K resolution (SN: 94) and 5 active regions using 1K resolution (SN: 73) SDO images on the visible solar disk. 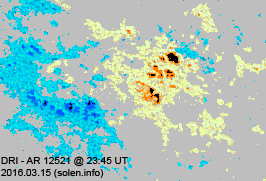 Region 12519 [N05W20] developed slowly as new positive flux emerged to the south of the largest spot. The region has minor polarity intermixing. Region 12521 [N19W36] decayed slowly and quietly. 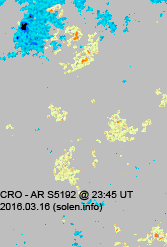 New region 12523 [S10W22] emerged on March 15 and was numbered the next day by SWPC as the region began to decay. 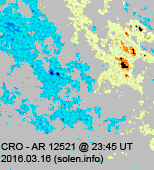 New region 12524 [N15E77] rotated partly into view on March 15 with SWPC numbering the region the following day. C flares are possible and maybe even a minor M class flare. New region S5192 [N12E27] emerged with a few spots. 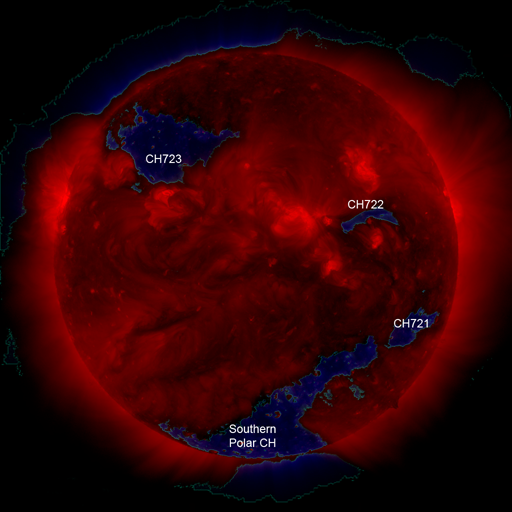 A new northern hemisphere coronal hole (CH722) rotated across the central meridian on March 13-14. A recurrent northern hemisphere coronal hole (CH723) will likely rotate into a potentially geoeffective position on March 18-19. The geomagnetic field is expected to be quiet to minor storm on March 17 due to effects from CH722, becoming quiet to unsettled on March 18 and quiet on March 19-20. Effects from CH723 could cause unsettled and active intervals on March 21-22.